Instead of eating healthy like I said I would, I am currently eating a biscuit. Scrap that - I have been eating biscuits, lots and lots of them. I found an unopened biscuit collection from Christmas and sadly, I have been stuffing my face for 30 minutes. At this point in time, I regret nothing. Remind me not to complain tomorrow? haha ;) I hope your week is going okay girls! I know most of you are either back at work, school or uni. I'm back at uni next week..I'm slightly 50/50 about getting back to the routine of eating super noodles and living in the library again... I do love doing my journalism work though, I just love writing! :) Anyway, before I start my usual rambling, I just wanted to tell you what I've been up to this week. It was my sister Rebekah's 18th birthday yesterday so we had a nice meal (a wide variety of seafood) and then she opened her presents. 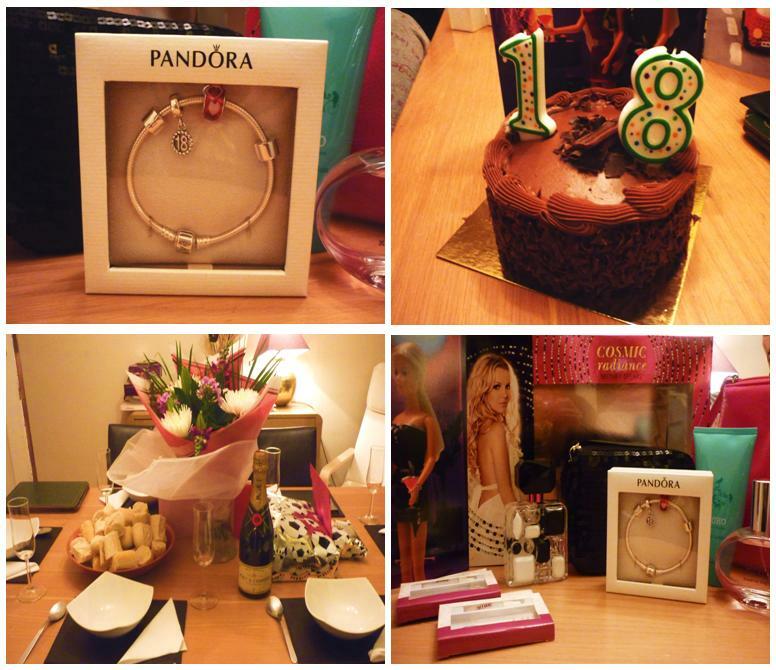 She got a Pandora bracelet from my mum and dad and a few other little bits. I bought Rebekah my speciality - Britney perfume and lots and lots of make up ;) haha. I love the bracelet that my mum got her because it has a little 18 charm on it. I bought Rebekah Britney's Cosmic Radiance perfume and it smells gorgeous! Subconsciously I may have just bought it for Rebekah so I could then steal it..I don't think she'll let me carry out this idea though. now following you! follow back hun? just found ur blog,had to follow! You have a cute blog :) thank you very much for following mine!